One of the few remaining Coelacanths in the Sonic series is coming to a PC near you soon. 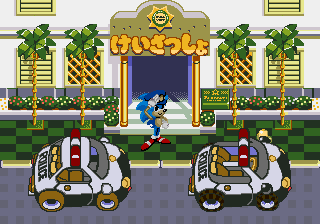 Waku Waku Sonic Patrol Car is a relatively obscure arcade title where the player drives in a car booth and assists a police clad Sonic. It’s also one of the earlier instances of a fully voiced Sonic early in the brand’s life, albeit in Japanese. Sadly, it has been increasingly difficult to find a working machine in public, with one of the most recent reports being that some friends over at Sonic Paradise found the machine in a Spanish mall, albeit with a broken steering wheel. Starting with the next release of MAME, you can enjoy this odd bit of Sonic history too, thanks to an effort to secure the board and the generous donations of many people. Further documentation about the game can be found here. The video below, recorded by Gavin Hugh, shows one such working booth in Japan in 2012 and features game play. Using the steering wheel, the player drives through the busy city streets and avoids traffic until an encounter with Dr. Eggman happens. Regardless if you do well or nothing at all, you’ll reach the Eggman encounter and even if you beat him or not, the game is soon over. No tickets are dispensed and the player is only awarded a score and a star ranking. It’s pretty basic as far as arcade games go, but that isn’t a big shock. It’s an attraction ride game for kids after all. It’s not a unique game as there are many others with similar gameplay that remain undumped, but it is another obscure bit of Sonic history down. That doesn’t leave much left to dump, short of someone going crazy and finding/repairing a SegaSonic Popcorn Shop machine. That said, if trying to preserve and dump old arcade boards interests you, definitely explore MAMEWorld and other preservation and documentation groups.